This easy recipe for maple butter mashed sweet potatoes will become a firm favorite in no time. The mash is so smooth and creamy and perfect as a side dish. Creamy mashed sweet potatoes is such a luscious side dish for pretty much anything and is a regular feature on our family’s menu. 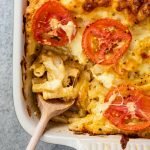 From quick weeknight dinners where it’s served alongside chicken or pan-seared fish or as part of a feast for Sunday lunch (it is particularly fabulous served with roast chicken and crunchy potatoes). This version is our family’s favorite and is flavored with maple syrup, butter and thyme. It’s luscious and creamy and totally delicious and will make the perfect Thanksgiving side dish. 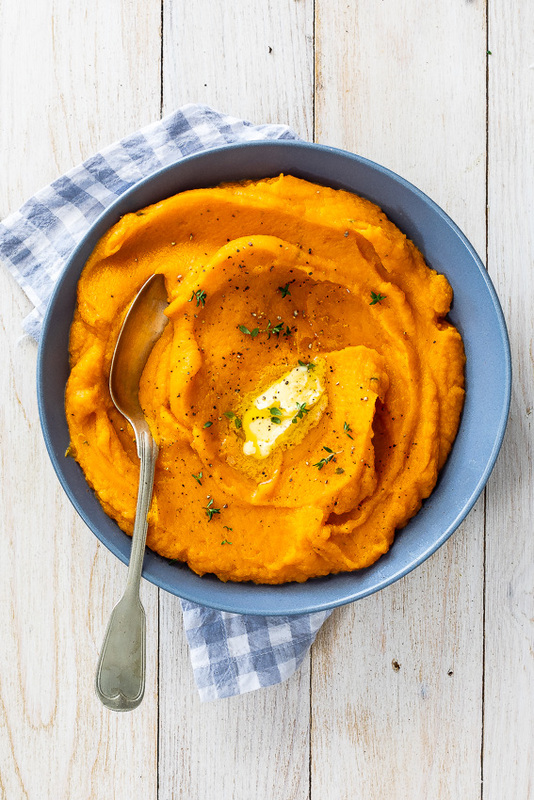 How do you make easy mashed sweet potatoes? Peel sweet potatoes and chop into large chunks. Steam until a knife can be inserted easily then remove and allow to rest for 10 minutes. This allows excess moisture to evaporate. If the sweet potatoes are too wet, the finished mash won’t be as creamy as it could be. Mash the sweet potatoes with maple syrup and butter and season with salt and pepper. 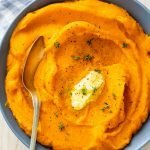 What is the best way to mash sweet potatoes? 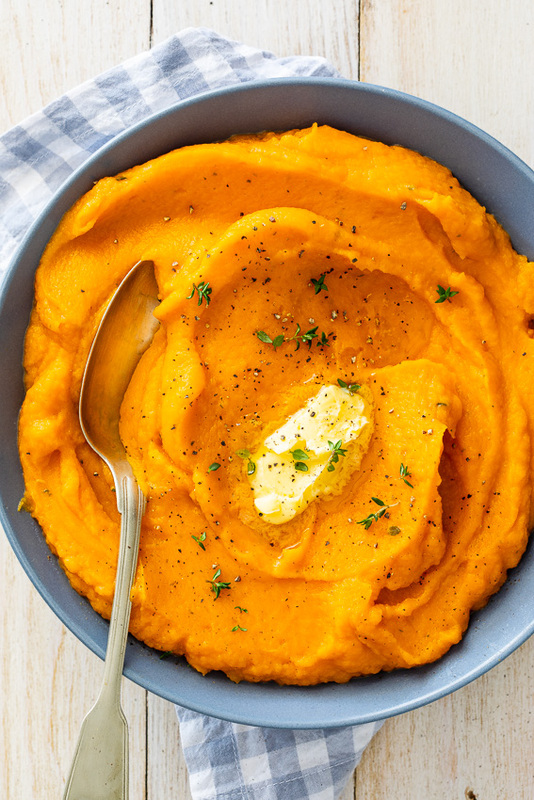 For the creamiest mashed sweet potatoes, use an immersion blender or food processor. Alternatively you can use a hand blender and whip the steamed sweet potatoes or use a hand masher. What spices go with sweet potato mash? Sweet potato is a great canvas for flavor. You can keep it classic and flavor it with herbs like thyme, sage or rosemary or jazz things up by flavoring it with curry spices like turmeric, coriander, cumin and cardamom. Smoked paprika, oregano and cayenne pepper all work well too. How long can you keep mashed sweet potatoes in the fridge? 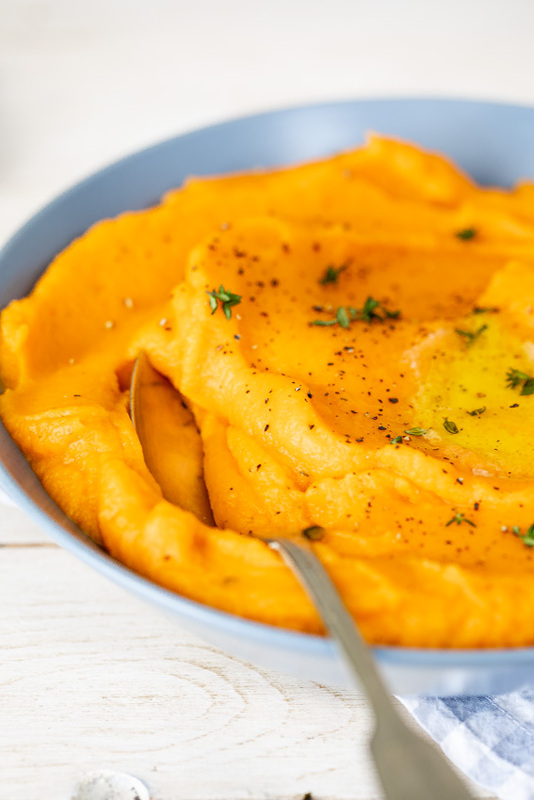 The finished sweet potato mash can be kept covered in the fridge for a 1-2 days but to make it even further in advance, steam and mash the sweet potatoes without the butter and cream. This way the sweet potatoes can be kept covered in the fridge for up to 7 days. Simply add melted butter and cream to the sweet potatoes and heat over medium-low heat in a saucepan. Steam the sweet potato with the fresh thyme until a knife can easily be inserted. 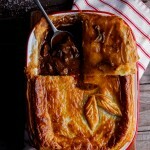 Remove from the heat and allow to rest for 10 minutes, uncovered, allowing excess moisture to evaporate. Place the steamed sweet potatoes, butter and cream in a large bowl then mash until smooth. Season to taste with maple syrup, salt and pepper and add the time. Incredible! I’ve never had sweet potato mash like this. Can’t wait to make it for my family on Thanksgiving. Yay! So good to hear. So smooth and creamy! yum! Made this for Sunday lunch with roast chicken. My husband literally licked out the bowl and it was the first time my kids actually finished their mash. Thank you so much for an excellent recipe.